Increasing access and equal opportunity for people with disabilities by building the capacity of Independent Living Centers. Learn more about CFILC and what we do. 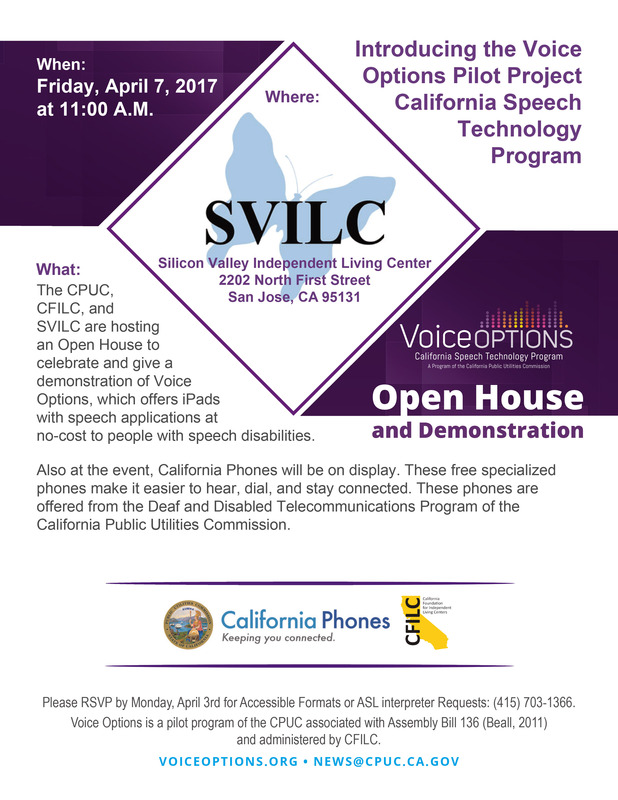 San Francisco, CA – The California Public Utilities Commission (CPUC), Senator Jim Beall (D-San Jose), the California Foundation for Independent Living Centers (CFILC), and the Silicon Valley Independent Living Center (SVILC) are hosting an Open House in San Jose to celebrate and give a demonstration of Voice Options, which offers iPads with speech applications at no-cost to people with speech disabilities. All are welcome to attend the Open House! Light refreshments served. WHEN: April 7, 2017, 11 a.m. - 1 p.m.
WHAT: Voice Options is a pilot program of the CPUC associated with Assembly Bill 136 (Beall, 2011) and administrated by CFILC. The program loans iPads with speech applications to Californians who are not able to speak, or who have difficulty speaking, so they can determine if using an iPad increases their ability to communicate. Individuals may borrow an iPad at no cost for up to 30 days to determine if using a speech app increases their ability to communicate. If the user determines a speech app on the iPad works well for them, they may apply for a long-term loan of the device and their favorite speech app. Long-term loans require a verification of disability status by a designated professional. Individuals can participate in this program by visiting one of 10 Demonstration Centers operated by CFILC in the following cities: Anaheim, Grass Valley, Los Angeles, Redding, Sacramento, Salinas, San Bernardino, San Diego, San Jose, and Santa Ana, or by visiting http://VoiceOptions.org, or calling toll-free (800) 390-2699, or emailing info@voiceoptions.org. California Phones from the Deaf and Disabled Telecommunications Program of the CPUC will have California Telephone Access Program (CTAP) equipment on display and staff available to discuss CTAP. For more information about the CFILC, please visit http://cfilc.org. For more information about the CPUC, please visit http://cpuc.ca.gov. Sacramento, CA – The House plans a full floor vote on the American Health Care Act on Thursday, March 23. The California Foundation for Independent Living Centers and Disability Rights California will hold a news conference to urge Congress to preserve access to Medicaid services (Medi-Cal in CA). Advocates will focus on preserving Community First Choice Option (CFCO). It is an optional Medicaid funding incentive that provides additional funding for community-based services for people with disabilities. WHEN: Wednesday, March 22, 2017, 11:00 a.m.
INFORMATION: Under the proposed American Health Care Act, 24 million people would lose their health insurance and there would be nearly $900 billion in federal cuts to Medicaid, which is Medi-Cal in California. The legislation would eliminate the CFCO by 2020 as part of a strategy to introduce block grants and cut Medicaid. Members of the disability community will express their concerns that the House is pursuing legislation without consideration for the many people with disabilities whose lives hang in the balance.